Ruchika Social Service Organisation (RSSO) established in 1985 is dedicated to rescuing street children and focusing on their overall development through education. RSSO’s journey began in Bhubaneswar with one school on a railway platform and has multiplied to twelve such schools. With an emphasis on the Right To Education, RSSO works on the ideal: ’if a child cannot come to school, then the school must come to the child’. The neglected children are often subject to unfortunate events such as abuse, starvation, child labour and even prostitution. The ethos of RSSO, thus, is to arrange for basic formal and non-formal education, nutrition, healthcare and emergency assistance in a joyful and creative atmosphere. RSSO imparts education without disrupting the routine of employed children and aligns them into mainstream schools at an appropriate stage. The key focus area for RSSO is education and includes platform schools, remedial education programmes to reduce dropout rates, balwadis and creches. RSSO sponsors girls from slums to complete their high school certificate exams. A toy library is run by RSSO to enable young children to express their feelings. RSSO concentrates on inclusive education for streamlining children with special needs into regular schools. It has two inclusive parks and four inclusive recreation centres for needy slum children. A project for disinfected safe water and waste management at low cost is implemented by RSSO. RSSO also organises awareness programmes to educate the masses about HIV and STI. Vocational training such as tailoring, cooking and beauty therapy is also imparted for the benefit of children not willing to attend schools. A 24 hour helpline for vulnerable children and women suffering from violence has been initiated by RSSO. It runs shelter homes: Asra for destitute boys and Sradha Bhawan for girls and women. Adding a feather to the cap, four senior RSSO teachers were appointed as Education Ambassadors to work in 60 government schools for effective implementation of RTE (Right To Education) provisions. Foreign Sources: In FY13, 67% (Rs14mn) of total funds were received through sources such as Michael and Susan Dell Foundation, Ruchika Thomas Voor India (Belgium) and Paul Hamlyn Foundation. Foreign funds have been in the range of 67% to 73% of total income during FY10-13. 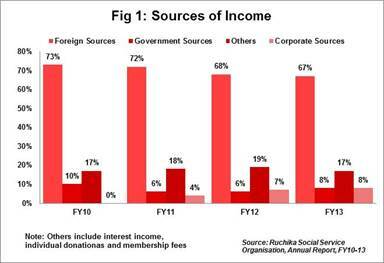 Other Sources: Interest income accounted for 15% (Rs3mn) of total income in FY13. Government sources and Non-Government Funding Agencies (NGFAs) each contributed 8% (Rs1mn) of total income. 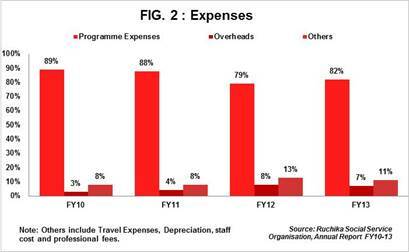 Total Expenses: In FY13, 86% (Rs18mn) of total expenses were incurred on programme activities (sector average: 77%). Overheads were to the tune of 7% (Rs1mn) of total expenses (sector average: 14%). In totality, expenses aggregated Rs22mn in FY13. Staff cost is included in programme expenses as exact breakup for salaries is not available. Investments: Funds set aside for corpus are invested in fixed deposits as a regular practice. In FY13, investments accounted for 59% (Rs31mn) of total assets. In previous years, corpus money included in restricted funds were invested in fixed deposits but not reflected in corpus fund. Investments have ranged from 59% to 67% during FY10-13. Trust Corpus Vs Unutilised grants: Unutilised grants include funds set aside for corpus during FY10-12. In FY13, corpus funds included in unutilised grants were transferred to corpus and corpus fund readjusted to reflect the correct figure. Thus, unutilised grants which were in the range of 44% to 46% during FY10-12 have decreased to 19% of total funds in FY13. Trust corpus stands at 47% (Rs25mn) of total funds in FY13. General funds: General funds have stagnated in the range of 24% to 26% of total liabilities during FY10-13 on account of increasing deficits since FY11. Income growth rate: RSSO posted a total income of Rs21mn in FY13 with an income growth rate of 31% as compared to negative growth of 15% in FY12. Inspite of growth in income, RSSO witnessed sharp increase in deficit from Rs0.17mn in FY12 to Rs1mn in FY13. The CAGR of income during FY10 to FY13 is 6%. Self-sufficiency ratio: In FY13, the ratio for RSSO was 17%. The ratio indicates ability of an organisation to meet expenses from its own funds. Own funds include individual donations, interest income and membership fees. RSSO’s own funds accounted for only 17% of total income in FY13 as the major income contribution was through foreign funds. Dependency: RSSO largely depends on foreign funding as is evident from the funding breakdown during FY10-13 (in the range of 67% to 73%). As a thumb rule, dependency ratio of 20% on single source of income is acceptable. Anything over and above increases vulnerability of the organisation. However continuous support of foreign donors is evidence of the confidence in the organisation. Corpus Funds to General Funds: RSSO has set aside a large amount (Rs25mn) as trust corpus in FY13 which takes the corpus figure to almost double the figure for general funds. In FY13, Corpus to General funds ratio was 181%. Shortage of resources: Getting adequate and timely resources for government aided projects is a task. Space Constraint: RSSO encounters issues of insufficient space in accommodating temporary offices in the vicinity of its projects which are located mostly on railway platforms. Support: Establishing good rapport with the Government schools to streamline children in remedial centres run by RSSO is a challenge. Attrition: RSSO faces issues of retaining committed and skilled staff. Shortage of Funds: RSSO seeks financial support for continuation of the women helpline project. Lack of support could lead to project discontinuation. RSSO is accredited by Credibility Alliance for transparency and accountability. RSSO has experienced degree holders with diverse background and rich experience on its board. The board members are associated with reputed organisations and renowned in their space. The Board meets four times a year. RSSO follows a practice of sharing the feedback report with the sponsors and donors providing details of the child with a photograph within four to six months of donation. Ms Inderjit Khurana, founder of RSSO has received awards such as Children’s Nobel Prize, National Award for Child Welfare and Henry Derozio Award. She was also on panel of The Clinton Global Initiative Summit held in 2007.